The first religious house at Melrose was said to have been founded by St. Aidan c. 660. Its second prior was St. Cuthbert, the apostle of the borders, who dwelt there until he became prior of Lindesfarne in 664. The house at Melrose later became one of the resting places of his body before it was taken to the place where Durham Cathedral was founded. Although the house was destroyed in 839, by Kenneth King of Scots, there was still a church there in the twelfth century. In 1136 King David I (1124-1153), possibly under the influence of his friend St. Aelred, invited a group of monks from Rievaulx to settle at the old site at Melrose. A few years later the monks moved to the present site, only two miles up the River Tweed from the old monastery. It was the earliest Cistercian monastery to be founded in Scotland and in turn became the mother-house of four other Scottish abbeys, as well as Holmcultram in northern England. The abbey took less than ten years to complete and the church was dedicated on 28 July 1146. The abbey was extremely well endowed, not only by its royal founder, but by succeeding sovereigns and countless benefactors. Melrose was so rich in lands and possessions that its annual revenue converts as approximately £100 000 of present money value. An example of the application of these revenues is revealed in twelfth-century records. These state that during a time of famine four thousand starving people were fed by the monastery for three months. It was thought that the community at Melrose once numbered two hundred monks and still contained one hundred and thirty at the beginning of the sixteenth century. The house was not only famed for its wealth, for many of its abbots were men of distinction and honour. St. Waltheof, stepson of King David and at one time prior of Kirkham, was abbot of Melrose from 1148-1159, and in future destined to become a saint. He was a friend of St. Aelred and had previously been proposed for the see of York, but had been prevented from becoming archbishop by King Stephen of England (1135-54). He endowed Melrose with a reputation for sanctity and learning which placed it on a par with houses such as Fountains and Rievaulx and made it the premier abbey in Scotland. The tomb of St. Waltheof, in the chapter house, was later to become the focus of pilgrimage. Other notable figures include Abbot Joscelin, afterwards bishop of Glasgow (1175), who took a prominent part in the construction of Glasgow Cathedral, intended as a shrine for the body of St. Mungo. Abbot Robert (1268) had formerly served as chancellor of Scotland; Abbot Andrew (1449) became Lord High Treasurer, and many others were raised to the episcopate. In 1249 King Alexander II ordered that his body be buried in the church at Melrose and in 1391 the abbacy was granted the mitre as recognition of its status. However, Melrose was positioned on one of the main roads running from Edinburgh to the south making it particularly vulnerable to attack. The monastic buildings were burnt during the campaigns of Edward I, 1300-1307, and in 1322 the abbey was sacked by the retreating army of Edward II, at which time several of the monks were slaughtered. Following this incident Robert the Bruce ordered for Melrose to be restored so that that the abbey might resume full functions. By the end of the century Melrose had fallen victim to the English yet again. In 1385 the abbey was burnt to the ground by Richard II and his army. The rebuilding of the abbey church was underway by 1389 although it seems the scale of the new work was so great that it was never fully completed. The greatest damage was incurred during the earl of Hertfords invasion in September 1545, and it seems Melrose never recovered from this blow. In any case the abbey had already fallen under the control of lay lords who involved the abbey in a series of disputes. The period between 1486 and 1507 was characterized by protracted litigation over the abbacy. The dispute was resolved in 1507 when William Turnbull, abbot of Melrose, was transferred to Coupar Angus and replaced by Robert Beaton, abbot of Glenluce. Following Beatons death another dispute arose between John Maxwell and Andrew Dury, the latter receiving the abbacy in 1525. Dury retained the position until he was appointed bishop of Galloway in 1541. From 1541 the abbacy was held by a series of commendators. The first to receive the post was James Stewart, eldest son of King James V, who held the position until 1557. In 1609 the abbey was erected into a temporal lordship for John Ramsey, Viscount Haddington, who then took the title Lord of Melrose. It seems that the abbey thereafter fell to ruin, despite the continued use of the presbytery as the parish church for some time. The lordship of Melrose remained with the Haddington family until the late seventeenth century when it was bought by Anne, Duchess of Buccleugh. At the beginning of the nineteenth century, Sir Walter Scott was appointed Sheriff-Depute of Roxburghshire. Scott was a man who had a great love of the Scottish border county and a love of Scottish history in general. In 1822, with the financial assistance of the duke of Buccleugh, Sir Walter personally supervised the extensive repair work that was to preserve these ruins for future generations. In 1918 the duke of Buccleugh gave the ruins to the state, by which time the abbey had undergone further restoration and repair. The ruins at this site are thought to be the most spectacular in Scotland and among the finest in Britain. The fifteenth-century Gothic church, built after the attack of 1385, is the central feature: its remains are unrivalled by any other church in Scotland. Much of the church still stands to roof height at the east end and the stonework is heavily influenced by both French and northern designs. The rest of the complex is represented by low walling and foundation masonry: the cloister ranges show clearly the extent and layout of the monastic buildings. The tomb of St. Waltheof was excavated in the 1920s and is displayed in the Commendators house, now the abbey museum. 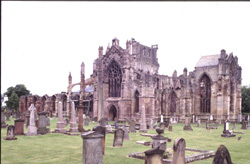 It has always been believed that the heart of Robert the Bruce rests within the walls of Melrose Abbey. When the king was dying, it was said of leprosy, he asked his friend Sir James Douglas to have his heart cut out and taken to the Holy Land. Sir James followed his wish and, with Bruces heart encased within a casket, set off for the Holy Land. Bruces body was afterwards taken to Dunfermline Abbey and there laid to rest. Sadly, Sir James died in Spain whilst fighting the Moors so the casket was returned to Scotland and taken to Melrose Abbey. In 1997 a casket was uncovered from beneath the chapter-house floor and was given to Historic Scotland for examination. In the absence of any comparable DNA with which to compare the contents of the casket, it was decided not to open it. During a private ceremony in 1998 the casket was replaced, undisturbed, to rest once more within the walls of Melrose Abbey. The site is now owned by Historic Scotland and is open to the public at regular times throughout the year.